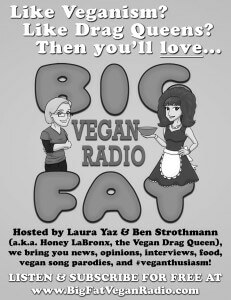 Looking for a FREE and EASY way to support Big Fat Vegan Radio? Click here to DONATE YOUR FACEBOOK OR TWITTER ACCOUNT! (Or Both!) This gives Big Fat Vegan Radio the ability to re-post or re-tweet our posts through your account! It costs you nothing, and you can cancel at any time! 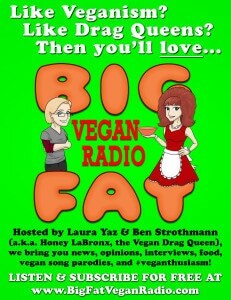 SPREAD THE WORD WITH A BIG FAT VEGAN RADIO POSTER! We have designed a poster you can download, print out, photocopy, and distribute anywhere vegans or hippies or lesbians congregate. Whether you wanna use your home printer, take them to Kinko’s (or whatever they call it now) or just post it online (til the point it becomes obnoxious) you can use these posters to spread the love to all your friends! Shop online with Vegan Cuts using one of these links, and Big Fat Vegan Radio gets a cut of the action! What do you get when you cross a Big Fat Vegan Radio listener with a Monthly Donation? For a one-time donation of any amount, you will get our undying gratitude and (during our fundraiser months) access to awesome discount codes! Plus our top donors will always be selected for a special prize! Become a member if you want to get ongoing perks and benefits! Members can either sign up for a monthly recurring donation, or buy a whole year up front and receive two free months! That’s right — you will get access to our exclusive “Secret Episodes” where Ben & Laura talk about whatever they want — uncensored! You’ll not only get the Secret Episodes, you’ll also get access to regular Audio Commentary recordings from Ben & Laura as they watch a movie together (usually a terrible one) and run their mouths throughout. Because what’s better than watching Mariah Carey in “Glitter”? Letting Ben & Laura ruin it for you with their snappy narration! Of course you’ll also get access to the Secret Episodes and the Movie Nights, but you and only a few select members will get to join Ben & Laura on a Video Chat (through Google Hangout). Our Video Chat will be broadcast to our YouTube Channel where you and other select members can go back and watch them at any time! Honey LaBronx will marry you! That’s right! (Kinda!) If you love us enough to pledge $50 a month, then not only will you get access to all the awesome incentives above, but Honey LaBronx will officially change her relationship status on Facebook so that the whole world knows she is yours. All yours! 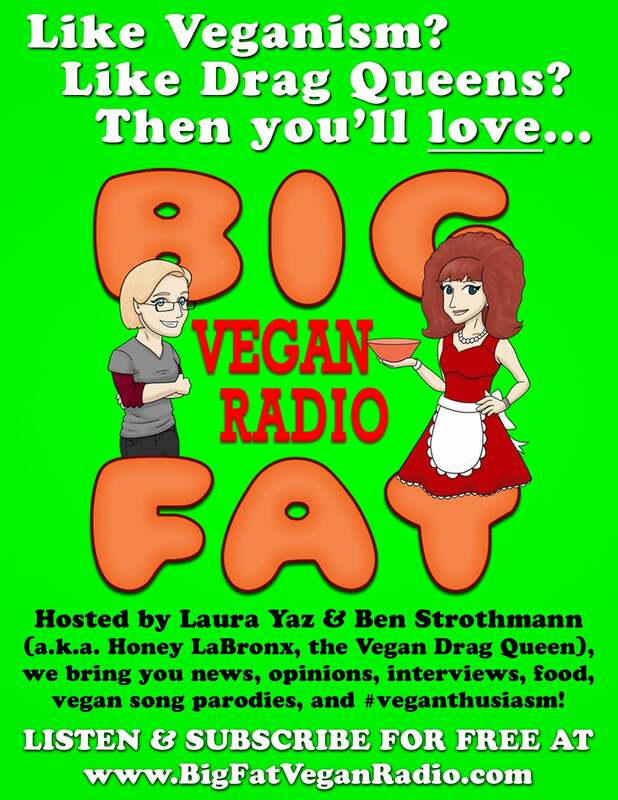 Not only will you have access to all the incentives listed above, but you will be named in every episode as an official sponsor of Big Fat Vegan Radio. BOOM! No time commitment required for monthly memberships. You may cancel at any time.